The participants in “Steampunkinetics: Building Art into Science,” including John Thompson of Hollis, N.H.
A pinball starts out at the top of a giant contraption, working along a copper track that curves and loops through a maze of five boxes. 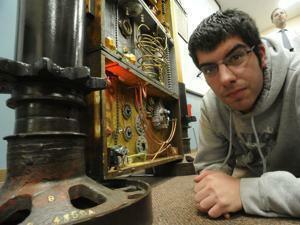 Andrek Godoy is proud of a section of a piece he worked on. The curious course takes the ball past antique clock parts and hinges; patinaed hooks, brackets and door knobs; old light fixtures, outlet faceplates and porcelain toilet flush handles; and even a discarded sunburst-shaped airplane part affixed with a pair of vacant blue eyes. A whimsical device worthy of Rube Goldberg, it is the culmination of nine weeks of invention, reinvention, tinkering, and trial and error. 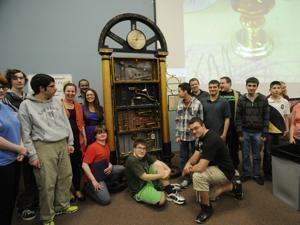 Fifteen young adults on the autism spectrum came together to create it through a first-of-its-kind art therapy program, “Steampunkinetics: Building Art into Science,” at the University of Massachusetts Lowell. An exhibition and reception for the Steampunkinetics” project will be held from 6 to 7:30 p.m. Friday in the Northeast Arc’s Gallery at Southside, on 6 Southside Road in Danvers. Steampunk is a burgeoning aesthetic — and, some say, subculture — that melds antique mechanical and industrial objects and elements from science fiction with modern-day items (consider it Jules Verne, 3.0). It incorporates Janusian thinking, a paradoxical perspective based on Janus, the Roman god associated with doorways, beginnings, and transitions. Many of the participants and some of the staff are shown with their just unveiled creation. Janus was depicted with two faces looking in opposite directions — one ahead, the other behind. Steampunkinetics came about through a collaboration between eminent steampunk artist and designer (and self-described steampunk evangelist) Bruce Rosenbaum of Sharon, and UMass Lowell assistant professor of psychology Ashleigh Hillier, who has been involved with various initiatives for young adults on the autism spectrum. 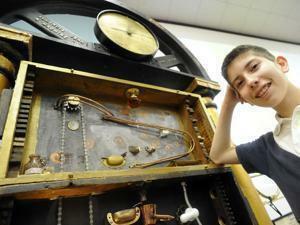 The two found that the eccentricity and intricacy of steampunk is an intense draw for people with disorders on the autism spectrum, who often excel at tasks centered around technology, mechanics, kinetics, and the understanding of how things work. Hillier said they also are highly creative, often with phenomenal attention to detail, and have a piecemeal cognitive processing style that supports divergent thinking — the very essence of the steampunk design process. 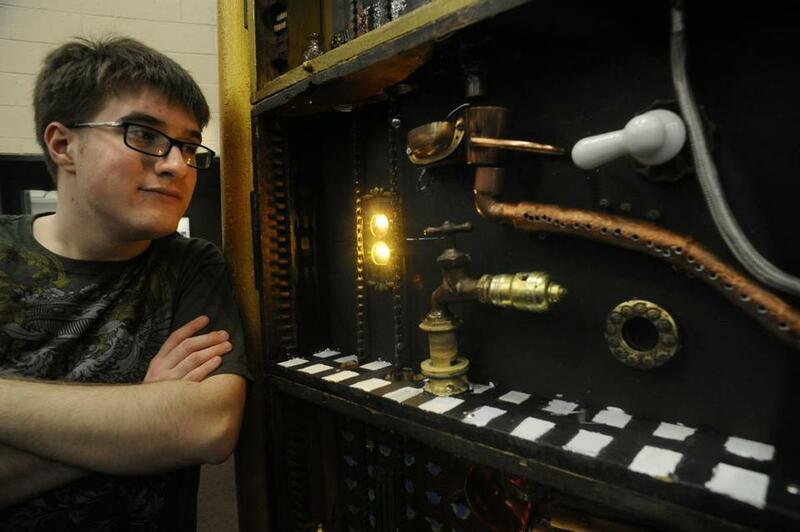 Rosenbaum, who is working on various projects around the world and gives tours of his “steampunked” house in ­Sharon, said that an additional appeal of the aesthetic is that it is decidedly outside of the mainstream, which can very often fit with the perception that many intellectually disabled individuals have of themselves. During the program, which concluded late last month, the 15 participants were broken into small groups. The goal was to create a house tower made of separate boxes decorated as different rooms but connected into a single cohesive, working structure. The participants visited a salvage yard to pick out various decorative and working elements, and finally collaborated to both bedeck their boxes and incorporate the track that would allow pinballs to travel down through the tower. In the final product, which resembles an enormous, transformed grandfather clock, the boxes are stacked one on top of the other, supported by porch columns atop bases made of giant sprocket gears, and topped with a gear mold dome and steam gauge. Michael Nardone calls his piece of art The Scarey Basement. A bicycle-chain pulley carries the balls to the top; they then run along a track made of copper refrigerator tubing through the “rooms,” painted and decorated to look like a games area, gym, library, boiler room, and basement. Affixed throughout are faucets and fixtures, gears, door knobs, and the silver sunburst face, which its creators dubbed Medusa, at the bottom. Ultimately, Hillier explained, the goal was to help the participants increase self-esteem, improve attitudes toward peers, reduce feelings of stress and anxiety, and foster collaboration, communication, and the sharing of ideas — things that don’t always come easy to those on the autism spectrum. The program was funded by $2,200 from the UMass Lowell psychology department, and another $4,000 from the university’s Joseph P. Healey Endowment Grant program. Hillier plans to publish her findings; the hope is to fund “Steampunkinetics’’ again next year, and possibly replicate it elsewhere. Over the art and technology project’s nine weeks, its organizers, volunteers, and participants saw and experienced some marked changes. Rosenbaum, for his part, is even more enthusiastic about the potentials of steampunk. “I think it can help change and improve lives,” he said. Participants, meanwhile, noted the various challenges and frustrations they faced and, ultimately, overcame. Elric Murphy agreed. He particularly had to come to terms with the ever-shifting nature of the project, he said, and the fact that what his team sketched out at the beginning wouldn’t necessarily be reflected in the finished product.